Shadi Bakhour, B2B Business Unit Director, Canon Middle East, talks us through what they will be showcasing as part of Gulf Print & Pack’s Innovation Trail of live demonstrations (stand 1D10). What are you showcasing at GPP 2019? At the event, Canon Middle East will be presenting a live demonstration of a central reprographic department (CRD) through designated zones for prepress, press and post press. While the prepress will demonstrate a complete management of the production workflow of the printing operation of the CRD, the press will highlight Canon’s different technologies ranging from cut sheet colour represented in imagePRESS, to block and white varioPRINT Titan and varioPRINT DP Line technologies. In addition, it will also incorporate wide format printing represented by Colorado 1640, Plotwave 365, imagePROGRAF TX-4000, imagePROGRAF TM-305 MFP, and imagePROGRAF PRO 6000, and a virtual demonstration of Commercial Printing Inkjet Cut sheet and Continuous Feed Products. The Post Press Zone, the next step in the process, is where the final finishing touches will be added to the product before it’s ready for shipping. The process will be completed at the fulfilment zone where the finished products for different industry verticals, such as education, hospitality, banking and commercial printing, will be prepared for dispatch. Canon will also show how to link decentralised office environments with Managed Print Services (MPS) and Digital Workflows to Central Reprographic Departments (CRD). This allows businesses to benefit from the best of both worlds by reducing cost, increasing efficiency, productivity, quality, and flexibility. The objective of this display is to educate customers about the value of having a complete printing solution at the organisation, how to scale it according to the different needs and objectives of the business processes, and what resources and knowledge is required to run the solutions. We hope that by walking through the process, customers will be encouraged to take strides towards unlocking their full printing potential. Have you exhibited at GPP before, and what benefit do you see in exhibiting at the show? Gulf Print & Pack successfully brings together our partners and customers from across the region and presents a great opportunity to showcase our latest innovations for printers and Print Service Providers (PSPs). Canon first participated in Gulf Print & Pack in 2009, to introduce our professional print solutions. Over the years, the company continued to address the needs of the industry by exploring bold new ideas and cutting-edge techniques. After a decade of building on our brand evolution, we look forward to celebrating our rich customer heritage spanning a diverse range of industries at this year’s exhibition. In the print and packaging industry, technology is consistently upgrading while customer demand fluctuates. One of the major trends in the past decade has been digital printing adoption in the place of traditional offset litho printing. A recent survey by the SGIA Commercial Printing Panel projects revenue increases over the next two years, averaging 9.4% for wide-format, 5.6% for variable-content toner digital, 4.1% for inkjet and decreases averaging 1.1% for lithography. The Middle East remains one of the world’s key commercial print growth regions, with huge untapped potential for digital technologies. This region’s continued growth is the result of increased adoption, new technologies, and expanding range of applications, as well as more efficient workflow solutions. Changing market potential, consumer requirements and demographic-driven trends have put pressure on customers in different sectors to evolve. With the print runs and turnaround times becoming shorter, and competition affecting pricing and profitability, customers are expecting more from print providers driving them to undertake initiatives to differentiate their offering and add new services. As the MENA retail space becomes more congested, brands are looking to customised designs and shorter run on-pack promotions printed on digital packaging presses to stand out among competitors putting an emphasis on print quality and technologies. The adoption of new technologies has also opened up a world of creative opportunities for pioneering businesses that are reaping the benefits of improved operational efficiency and productivity as well as new access to profitable new revenue streams. Canon remains committed to reimagining possibilities, supporting businesses across verticals with the widest print portfolio in the industry and unique heritage in imaging technology. Our ongoing dialogue with PSPs worldwide shapes our research and development around their three key priorities: boosting their productivity, enhancing the quality of their output, and increasing the range of media they can work with. What do you think are your growth prospects in the Middle East next year? The MENA region printing market is a significantly large one that continues to grow where the expansion is much higher than the global mean for increases in print revenue. 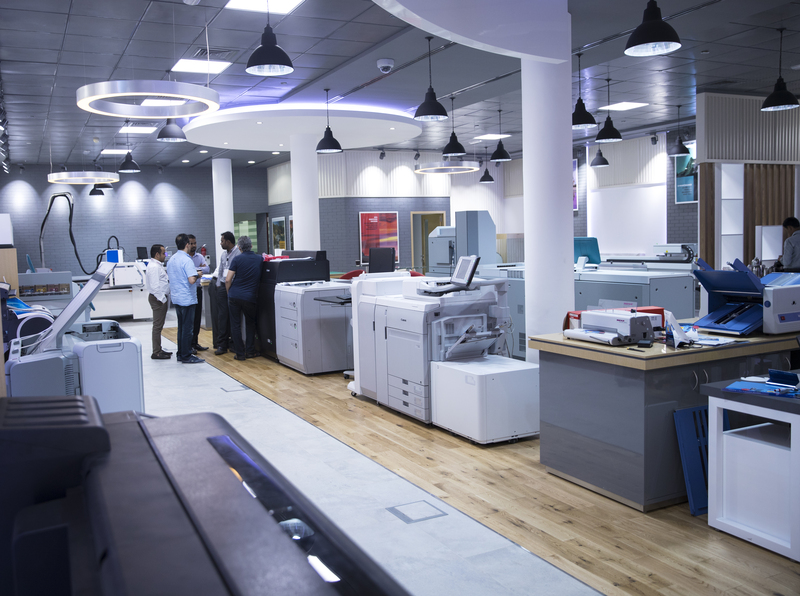 According to a report by Smithers Pira on the future of printing in the Middle East and North Africa, the region produced 2.4 trillion A4 prints and consumed 13.5 million tonnes of substrates in the year 2017. This is estimated to increase to 2.8 trillion A4 prints and 17.9 million tonnes by 2022, with respective year-on-year growth rates of 2.8% and 5.8% as compared to the global mean of 0.8% per year for the current decade. Canon’s strategy is to offer customised solutions and services that address the customer’s needs. This is supported by our wide range of printing technologies which range from wide to small format, toner to ink jet and cut sheet to continuous feed. In addition to this, our excellent after sales customer sales services has allowed us to be market leaders in the Middle East printing industry for the last couple of years, as per research by infosource. We have also invested in providing our customers with the best consultation services for each vertical which will help us to tap into new markets. What key trends are likely to have an impact on the region in 2019? The print and packaging industry has been growing rapidly in the Middle East and is becoming increasingly sophisticated and competitive. There are a plethora of opportunities available to print service providers with the adoption of digital technologies; it is only a matter of thinking creatively about equipment, techniques and substrates already in use but also finding ways in which they can meet different customer needs. Since 2017 up until 2022, according to the Smithers Pira report, the fastest growing print process will be digital, mirroring the wider transformation in global print usage and the increasing penetration of these systems into packaging. With worldwide economic challenges affecting the region, it does put pressure on print volumes as there is an increasing need for shorter runs and prints on demand. Today, it is a requirement to make printing a part of the customer channel mix to accelerate digital printing growth in the Middle East. The increasing need for customisations in sectors like interior décor will make room for the use of wide format and signage industries. Inkjet cut sheet and continuous feed will have a bigger share in the overall printing industry especially in book printing applications as it offers better economics, decent print quality, high speed, and productivity. Other key trends include sustainability in packaging where a report by esearchandmarkets.com predicts that demand for sustainable packaging will grow about 5.1 percent annually by 2025. Customers also continue to expect an integrated experience, now including the personalization of print and packaging to further engage with the brand. These trends will spur innovation in this industry as pioneering businesses look to leading technology providers to provide them with the competitive edge they require. Why did your company decide to participate in the Innovation Trail at Gulf Print & Pack 2019? The main objective for Canon Middle East at Gulf Print & Pack 2019 is to illustrate the real implementation of a fully functional printing environment in any organization, from decentralised to centralised printing. The event’s Innovation Trial is a good platform to present such a concept in an easy and structured way to customers and the industry. At the Innovation Trail, Canon will demonstrate the right tools to systematically uncover the full potential of the Central Reprographic Department (CRD). A variety of applications will be demonstrated on the stand showing our proposition for the verticals of Education, Hospitality, Banking and Commercial Printing with industry experts providing insight into transforming the CRD from ‘just’ the in-house print department into a communication service provider that’s vital to your organisation. What are you hoping visitors to your stand will learn? At this year’s exhibition, we are hoping that visitors will be inspired to seize new opportunities and push boundaries to stay ahead of the curve. A key objective is to educate customers about the value of having a complete printing solution and services at the organisation, and how to scale it according to different needs and business processes. By experiencing the real life operation and process, customers will be able to make the right decision when it comes to printing. How will your innovations help move the industry forward? At Canon we believe that innovation is a crucial aspect of success, to be competitive and rise to meet growing customer demands. It is not restricted to technology but also extends to providing new services, customer offerings, creative ideas for print applications as well as marketing and selling these applications. If a business is unable to keep up with this dynamic environment, it faces the danger of remaining stagnant and irrelevant. With this in mind, Canon’s value proposition for this industry is to enable businesses to keep pace in a rapidly-growing market driven by evolving customer demands. We remain committed to inspiring our partners and customers to seize new deals to meet their business aspirations with game changing technology. We place a great deal of determination in addressing our customer’s challenges and improve their business to help them stand out in the market. Read more about the Innovation Trail.